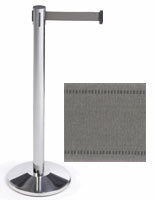 This periodical rack is constructed from brushed aluminum, creating a durable yet attractive fixture. When used indoors, the rack is also resistant to rust! 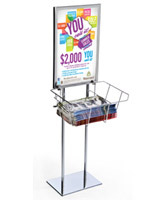 This catalog holder, periodical rack features (3) green-edge acrylic pockets for organizing your reading materials. Green-edged acrylic gives an appearance of glass, without being fragile. 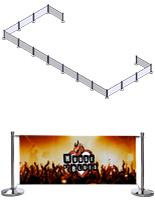 The periodical rack, such as our other wave-shaped systems, will ultimately help you increase sales while adding a modern element to any indoor venue. 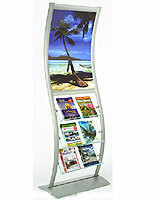 This periodical rack has a distinct, wave-like design to help generate interest in your display. 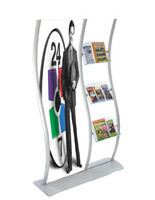 The periodical rack, also known as a literature display system, is perfect for any indoor environment with modern décor. 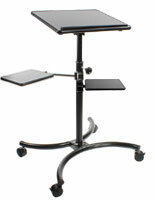 For example, an airport lounge or office lobby would both greatly benefit from incorporating this stand. You can also use the periodical rack inside a convenience store. 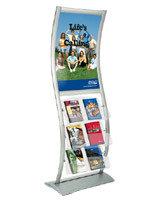 This catalog display is also an adjustable periodical rack! 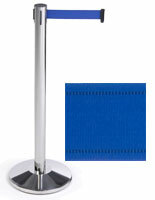 You can use the brackets to alter the height and orientation of each pocket. We even provide the periodical rack with (2) clear, plastic lenses to protect your graphics and create a double-sided fixture!